It’s not really noir and it’s hardly a procedural. After all, it’s not from the point of view of the cops, but an intrepid investigative journalist who is looking to clear a man’s name after 12 years. Henry Hathaway’s film has the feel of a docudrama much in the same vein as it’s post-war contemporaries T-Men and The Naked City. It’s methodical. It goes through the paces. Setting up the story by first going back to the prohibition era in 1932. That was the year that the unassuming Frank Wiecek (Richard Conte) was sentenced to a 99-year sentence thanks to some eyewitness testimony. Years later the story catches the attention of a newspaper thanks to an odd ad in a paper offering a $5,000 reward for answers. The editor of the Chicago Times (Lee J Cobb) thinks there’s a story behind it and that sends his ace bloodhound P.J. McNeal (James Stewart) out to dig around for answers. Others have sympathy for Wiecek, but McNeal comes into the story as a skeptic. He’s just looking for an angle, a way to spin it to get a good story. But after testimony, lie detector tests, and bits and pieces of information he begins to change his tune. However, the puzzle pieces just aren’t fitting together completely and he even begins searching around the Polish sector for the key witness Wanda Skutnik, but the state attorney’s office is putting pressure on him. In the end, it ends up being technology, in the form of blowing up a picture, that is able to set Wiecek free and it’s all thanks to McNeal. Obviously, the main reason to watch this film is Stewart because this film feels strangely different than anything else he ever did. After the war, he was done with the idealism of Jefferson Smith and later on he would devote himself to westerns and thrillers steeped in psychology. Call Northside 777 is a rather straightforward film, about cold hard facts, and the truth. Almost like an episode of Dragnet with Stewart’s reporter standing in for Joe Friday. His dynamic with Helen Walker feels genuine and real so it’s a shame that his home life did not play more of a role. 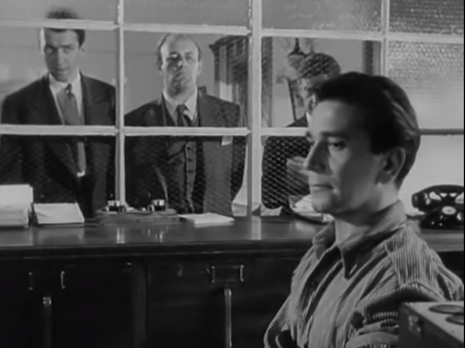 Richard Conte also does a good job at exuding innocence (very different from his role in The Big Combo). Aside from an understated role from Cobb, we also have E.G. Marshall, and we even see Thelma Ritter for a brief moment. This entry was posted in 1940s, Drama and tagged E.G. Marshall, Henry Hathaway, James Stewart, Lee J. Cobb, Police Procedural, Review, Richard Conte by 4StarFilmFan. Bookmark the permalink. Agreed. Call Northside 777 isn’t great, great, but I liked it. Stewart is outstanding.